Unveiled by Apple in 2001, iTunes store is one of the biggest online digital stores, in which you can purchase and rent couples of digital content, such as movies, TV episodes, music, ebooks, and more. If you are a bit strapped for cash, iTunes rentals must be the best service for you to enjoy your digital life with less money. All you should do is to enter iTunes store, discover your favorite movies, rent them at a relatively lower price compared to iTunes purchases, and then you are able to download them to your devices for watching. With the purpose for making the renting process on iTunes more unobstructed, here, we'll make an overview of iTunes rentals, including how to rent iTunes movies, iTunes rentals requirements and limits, rental costs, etc. There are a variety of factors to depend on the price to rent an iTunes rental, such as upload time, resolution including HD and SD, and sales promotion. There is a price list available for reference when you plan to rent a movie from iTunes. Please note that the eventual price you should pay is up to Apple's real-time quotation. 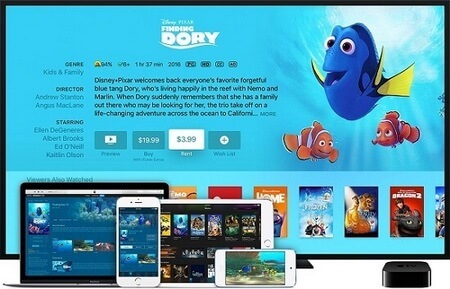 You are able to rent iTunes movies through a Mac or PC, an Apple TV, and an iPhone, iPad or iPod Touch. But no matter which device you have to rent iTunes movies, you should pay attention that there are some requirements to these devices. If you would like to get your iTunes movies from a Mac or PC, you need to confirm that you install iTunes with the version of 10.3 or later. For an Apple TV, it should equip with the latest version of tvOS. Regarding for iPhone, iPad, iPod Touch, please make sure that these iOS devices are running iOS 3.1.3 or later. As long as you possess one of these platforms with the above particular requirement, it's time to start your travel of renting iTunes movies with the same stunning quality as iTunes purchases. Now, we'll give the detailed tutorial on how to rent iTunes movies through a computer/iOS devices and an Apple TV. Double click to launch the latest iTunes store on your computer or one of the iOS platforms, sing in your iTunes account with your Apple ID, and then get into the Movies section to find out the movies that you'd like to rent. Please well note that some of movies are not available to rent. To see if the movie is allowed to rent, you just need to click the wanted movie to see whether there is a "Rent" tab near the "Buy" option. When you discover the "Rent" option, you can click it to download the rental to your computer or iOS devices immediately. To rent iTunes movies on home theatre system with Apple TV, you can open your iTunes store from the main Apple TV menu to look through these digital files. Note that you can’t rent TV shows in iTunes, only for movies. Once you find out the movie, please click it directly, and it will pop up a new windows, in which you can see the "Rent" section. Tap "Rent", you will be required to enter your iTunes account with your Apple ID. There is no doubt that iTunes rental has its absolute advantages for us to enjoy iTunes movies with the competitive lower price but the same amazing quality over purchases. However, nothing is perfect. There are still some restrictions existing in iTunes rentals, and you have right to know them before renting. Similar to other iTunes videos, iTunes rented movies are encrypted by FairPlay DRM technology, which are only allowed to be playable on Apple ecosystem. Due to the restriction of DRM, you are not able to sync iTunes rental movies to other Apple devices. Put another way, you can watch iTunes rental movies on one device at a time. If you want change the device to put the iTunes rental, you need to transfer it every time and it will disappear from the original device while copying. Generally speaking, you have 30 days to keep iTunes rented movies after you rent them. But you should be careful that after you start to watch them, you just have 24 hours (in the US) and 48 hours (in other countries) to finish watching these iTunes rental movies. Of course, during this period, you can playback them as many times as you like. When the 24-hour or 48-hour period is up, they will disappear from your iTunes library at once. If you would like to remove these limitations from iTunes rental movies and keep them permanently on any device, you will discover the best solution in the following content. Since the main reason that causes these restrictions is the built-in DRM protection in iTunes rented movies, all we need is a professional iTunes DRM removal tool to help us completely delete the DRM lock once and for all. Here, we highly recommend DRmare M4V Coverter for Mac, one of the most powerful iTunes DRM crackers, which is developed to strip DRM limitations from both iTunes purchases and rentals. What's more, it also enables you to convert iTunes DRM M4V to other common formats, such as MP4, MOV, MKV, AVI, etc. In this way, you can transfer converted DRM-free iTunes rented movies to other non-Apple devices, such as Samsung Galaxy S/Tab/Note Series, LG Optimus, Google Nexus, and so on. Certainly, the most extraordinary feature is that you can keep these iTunes rentals forever and share them with your family and friends freely.